National Al Purdy Day without access to my copies of him on CD. Played the 1994 Wired on Words cassette featuring poems--spoken word performances by Lynn Suderman, Julie Bruck, Clifford Duffy, Fortner Anderson, Stacey Engels, Ian Stephens, Corey Frost and Ian Ferrier. Second half of the show featured my recording of Hamilton poet, the Serif of Nottingham, Gary Barwin's 8 May 1999 reading in Fredericton. I supplied some Fredericton arts news. Show ended with "Land and Liberty" by Zach de la Rocha. a week after the fire . . .
last evening i was finally able to look at my first possible new apartment. easter weekend really messed the past four days for contacting people and for doing anything fast. was hard enough getting movers through an insurer-arranged contractor. on good friday they were there about three and one half hours---packing books for the most part. left at 1 pm. the sky started to sprinkle and we all know that the fire marshal could condemn the building at anytime so I was offered use of a truck w/ norma driving and son william to help lift & pack. beth friend phoned and immediately came over. i phoned biff and he came over. with the three vehicles we grabbed and hauled out more stuff including all art off the walls, my writer publication archives, manuscript originals, clothes, the two largest filing cabinets, my bike, and more. thankfully i had the storage unit on queen street already quite stogged with books and stuff. filled it even more. can't walk in it now. the hardest thing was having to destroy ALL electronics and electrical equipment in the apartment including computer, scanner, oki c5500 printer, lamps, digital camera, battery charger, phones, all power tools (saws, drills, dremel, glue guns), personal and kitchen appliances including lamps, extension cords, power bars, tv, cd, dvd & vhs players, 50w amp, marantz recorder, xlr cables, sure mic, blenders, coffee grinder, kettle, grills, skillet, et cetera, plus all bedding and towels plus all plastics including containers and anything using plastic handles or components. terrible mound of stuff destroyed . . . next tasks will be to price and date the acquisition of those lost/destroyed items; deal with the recovered items and their cleaning; and to negotiate the insurance claim settlement with the claim adjuster. i also have to secure a new home: have to look at places, many or most available for 1 may not today (and am not looking at anything available later than 1 may). have to fill in landlord application forms, sort out the finances for security deposit and first month's rent. have another place to view this morn but have heard it's above an indoor half-pipe and that would likely be noisy to work above . . .
Just out of the building at 2:38 AM, these were the flames and smoke pouring out windows in apartment 10 on the top floor. The fire quickly got into the roof and attic. Tuesday afternoon crew were assessing and then removing some of the very unstable front wall and stairwell (the former steeple). My apartment was the one on the corner of the second floor. It appears immediately above the roof of the backhoe. 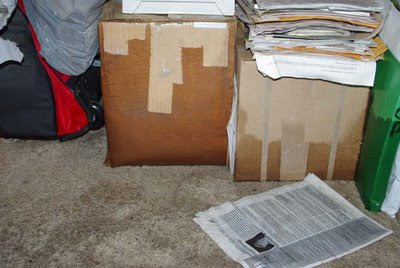 In my writing office, soaked boxes of books, the latest NB Ink newsletter and my LCP Council member binder in water. 2:30 this morning i bolted awake to the fire alarm. smoke falling down past the windows. i phoned 911. said there was afire. gave my address and following instructions, left the building after getting pants, sneakers, sweater and coat on. grabbed my camera and a journal from beside my bed and left. 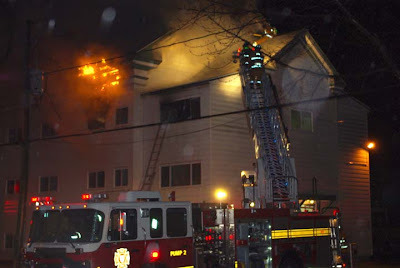 flames were pouring out the window of a bedroom in apartment 10 on the top floor. i know everyone in that apartment but didn't see any of them in the huddled cold, wet people on george street. heard that someone else saw k- leave but . . . ? during the next hour and a half we watched many firefighters with two ladder trucks and hoses, chainsaw, axes and breathing apparatus fight the flames the climbed up into the wide open space of the attic. flames were shooting across george street almost touching the stone of st paul's united. the apartment building will be abandoned. i hope that everyone got out alive. we're all in need of new homes, clothing and so much more. red cross gave room vouchers and a bag of personal hygiene stuff. hope to learn later about how much damage throughout the building. 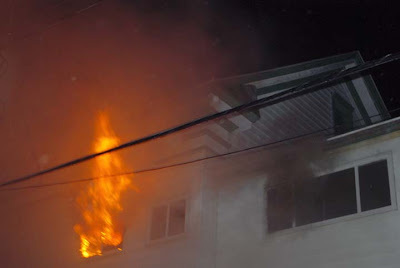 of course, water and smoke damage is disastrous for my writing, publishing and artmaking. i've no idea what, if anything, will be recoverable from my apartment and the computers and files, documents of broken jaw press inc. or my life. have to wait and see. have to phone the insurance company in about two and a half hours. will need to find a room and/or new apartment a.s.a.p. hopefully will have to rent a truck and storage space for stuff. probably should get a cell phone and voicemail for the business line. hope my laptop is recoverable and usable. don't know what i should do about the readings and freelance work lined up for tuesday-wednesday-thursday this week or the letters of recommendation and grant applications due or anything like that . 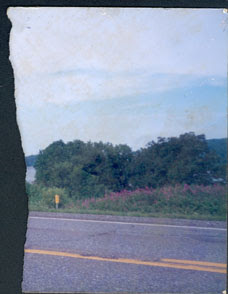 . .
A half photo of ? at a rural road location. Has a partial inscription hand written in blue pen on the back "Five [?] . . . / Mont . . ." . Printed on Konika paper. 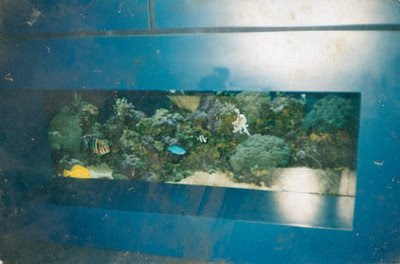 Photo of an in-wall aquarium printed on Fujicolor Crystal Archive Paper with a printing code line that possibly reads "(No.19A)011 12- 03 NNNNNH 0478U 093". Both were found near each other atop the melting parking lot snow near the fire hydrant on the Priesman Street side of the Smythe Street Canadian Tire Store after an LTTA TeacherArtist Training Session. As their rumble faded away in the distance from the direction of the nearest watering hole, a dazed, small man, with black powder smeared on his whiskered face, pulled himself upright out of a mess of crumpled boxes, strewn paper, and overturned furniture than had been his office. He swayed on his feet and with sandbagged eyes surveyed the damage and sighed. He knew they'd come back for him. They'd make him do horrible things: drink in public; make a fool of himself; make him read aloud words that would curl the petals of flowers and make loved ones howl and scream in the night. There would be another BlackTop MotorCycle Gang night of mayhem on the spring rain-soaked streets of Freddy Beach. He heaved his desk upright and found a not too broken but decidedly wobbly chair in which to sit. He hears sounds, a whirring and phut phut phut repeating over and over. He smiled. It wasn't from outside the office window with a cardboard panel from a wine box taped over a hole punched there during the last raid. No, the sound came through the wall from an inner room. Micah picked his way across the ruined office, careful to avoid daggers of shattered mirror on the floor outside the kitchenette and now doorless toilet. The door had been ripped of its hinges and kicked to pieces, panels of wood flying, in front of him. The bald badass reaking of beer and candied cigarillos that had held him tight almost whispered as he'd said, "We'll do to that to you, if you don't cooperate." Micah had nodded his head and gulped out, "Okay. Sure. Whatever you say." Micah took the lid off the toilet tank, reached a hand in and pulled out a key. In the hallway opposite the toilet was a half height steel door with curled decals warning DO NOT ENTER in bold letters above a lightning bolt and HIGH VOLTAGE below. Opening the door, he stooped and squat-walked two steps in then stood up. It was a small, windowless room with a fan in the outside wall above a bank of grey equipment with flickering green and red LED lights. The right end was busily moving up and down like it was doing something. Micah reached over, pulled out a stack of paper. 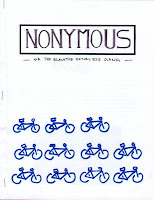 The top sheet read NONYMOUS—With the BlackTop Motorcycle Gang—. He'd done it. He gotten it on paper while they were destroying his office, his life. He'd be ready, when they returned. Better than WANTED posters at the police station and post office, he'd captured a likeness of the BlackTop MotorCycle Gang in words and pictures. They were loud and rude, sweet and perverse, poets and not-poets, their fukted-up and alive, singin' and spinnin', peelin' rubber and leaving tread all over the place. Tonight they'll be hoggin' the talkin' stick, raidin' the microphone. They'll be in your face and between your ears . . .
Bring money, watches, wallets, piggybanks, your stash, if you want to give a copy of Nonymous Three a good home away from the clutches of the BlackTop MotorCycle Gang.